Once the vulnerability assessment is complete, we will visit communities and organizations in Northeast Florida to discuss our risks and the benefits of resilience. As we have learned more about building resiliently and how insurance works, we have realized that we have many structures in Northeast Florida that predate the flood insurance maps and may not be built at the elevations that new construction would require. We have looked at these and where they are. We will convene to discuss the options for elevating and/or making structures more resilient to flood. We will look at how a property owner might finance such work and what alternatives exist for communities that want to support these efforts. NEFRC and county partners will work together to prepare for evacuations. The National Fish and Wildlife Foundation is doing a coastal resilience assessment of the St. Johns River watershed. This will provide a broad range of useful baseline data. Once this is complete, regional partners will meet to determine what data is needed for the various types of decisions to be made regarding resiliency issues. They will determine what data and/or analysis gaps exist, if any, and will work together to develop an approach to close the gaps. This will inform the community conversations. We worked with those who serve vulnerable populations to see if we are ready for a major event and to try to learn from the experiences of others. First up? Health care providers. Check out what we learned at the August 23, 2017 event. We convened local folks to choose the resilient building techniques that work here, so when builders build or residents renovate, their choices are local, durable and clear. Here is what we found. We engaged with the arts and education communities and others to help us imagine the future through a design and ideas competition that asked how we might rebuild to thrive after a disaster. The winning images are posted here. This type of program is a relatively new way for communities to get points (which can result in saving their residents money on flood insurance) in the Community Rating System. 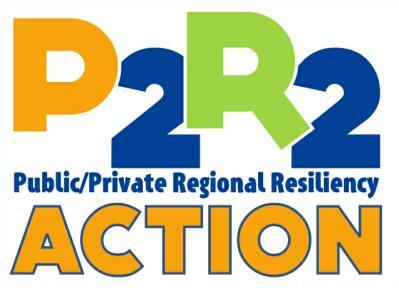 We support the actions of Nassau County and the City of Fernandina Beach as they partner to create a joint PPI, and will use the mechanism of the Northeast Florida CRS Users Group to share best practices with the potential to benefit all communities in Northeast Florida. Our vulnerabilities page contains examples of ways to look at our vulnerabilities. We will assemble better data specific to our region as it becomes available so that businesses and communities can assess their risk when considering investment. Northeast Florida has an assessment of the vulnerability to sea level rise of lands that provide ecosystem services. We tested a process to determine what lands may be more resilient and where new development might be encouraged. An overview of the process and our findings is here. We developed a checklist for communities to use to ensure resiliency is fully considered before infrastructure investments are made, and reviewed an approach to considering the costs and benefits of adaptation approaches. NEFRC is sharing a model recommended by the State DEO for the consideration of local governments as they update their plan as related to 163.3178 Florida Statutes. Using tools like the Infrastructure Checklist and adaptation cost benefit approach, NEFRC supports local governments in the region as they share best practices and inform the public about the importance of this issue. We created a survey to get folks thinking about the resilience of their business, NEFRC will not be tracking or analyzing any data provided by those taking the survey, it is simply a tool to help businesses think through their risk before a disaster happens. We found very helpful links that will assist with planning. We have been encouraging financial institutions to add resiliency to the topics they cover in financial literacy programs, and to include the topic in discussions preceding mortgage pre-qualification. Here is an overview of the topics that might be covered. We convened land use attorneys and experts to identify ways to incentivize investment to go to more resilient areas and to fund resiliency in renovation so that communities know their options. The results of their discussion about what might work in Northeast Florida is here. We identified the need to better understand how the insurance works. We similarly need to understand the considerations of banks. This will be helpful as we address Pre-Flood Map Building Resilience. Related notes are here. We will continue to advocate for training for elected officials, and will seek sponsors from the business community to offset costs if required, so they can better understand, champion and communicate resilience and the challenges we face. We have established a baseline for property and tax base at risk from a major hurricane and 1’, 3’, and 6’ of sea level rise. We will track metrics we feel can help us evaluate how we are doing at addressing resiliency. We will assist the Department of Housing and Urban Development as they implement their goal: Build Strong, Resilient and Inclusive Communities.